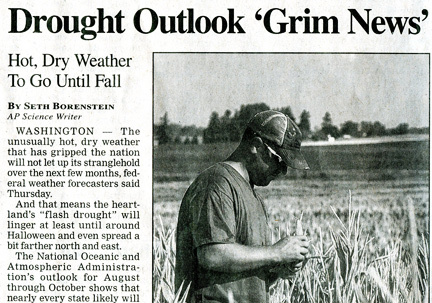 Fires, Severe Drought and 40,000 Record High Temperatures in 2012 – A New Normal in Global Warming? Friday, July 20, 2012, Albuquerque Journal. 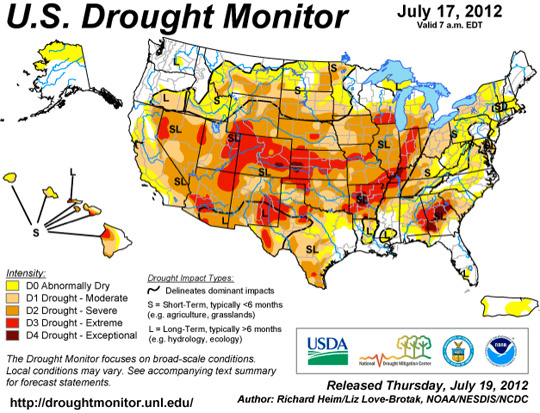 NOAA U. S. Drought Monitor as of July 17, 2012. July 26, 2012 Tucson, Arizona - In only the last six months since January 1st this year, the United States has set more than 40,000 high temperature records, but only 6,000 low temperature records. At the beginning of May, two massive wildfires burned in far West Texas. Next PostNext Updated: Was Biggest Canyon in the Solar System Scarred by Plasma? Was Biggest Canyon in the Solar System Scarred by Plasma?